Lightweight two-channel digital head amplifier for electric bass guitar that delivers 600 W of clean power and pure tone. It provide 2 channels, each with its own 5-band graphic EQ, a silky smooth optical limiter with on/off switch, headphone out jack, a stereo auxiliary input with Volume controls for backing tracks, a line input for additional input source, DI out with ground lift switch, line out, tuner out and FX Send/Return. Amplifier is constructed in an all-aluminium chassis with a 1/4" thick machined aluminium panel, a feature normally associated with expensive recording studio equipment. It also comes with a padded gig bag and rack-mount kit. Dimensions: 300 x 250 x 75 mm. Weight: 3 kg. 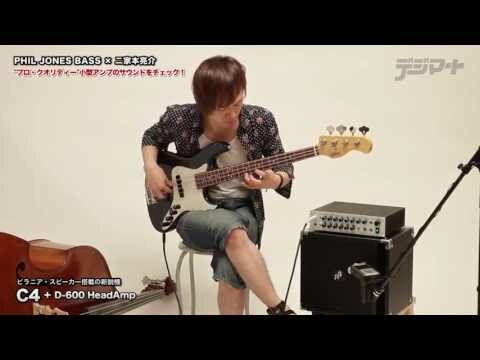 Do you own Phil Jones Bass D-600 or have you had a chance to try it?